The heat when one is next to one of the columns is intense. But once the light goes off the temperature drop is almost instantaneous. The columns are sometimes all on or all off but most of the time some are on while others are off. 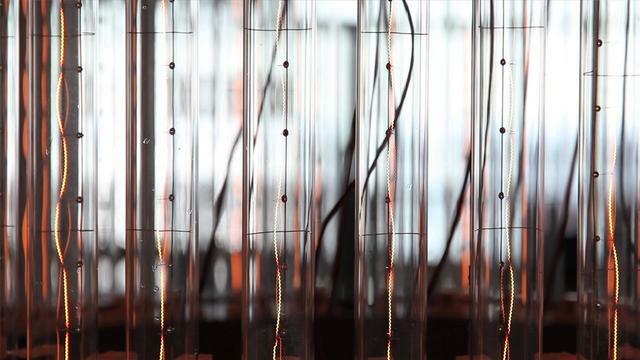 The glow and fade cycle is intriguing with the glowing columns exuding a strange glitziness while unlit they become simpler, but the cool transparency reveals the filaments, their mode of operation. 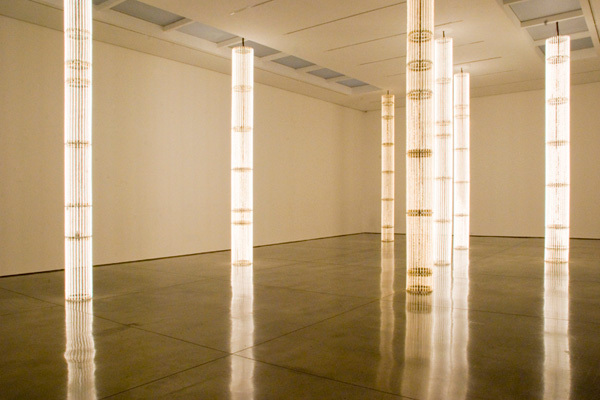 At White Cube with what seemed like an inescapable forest of columns the effect was intense. The lights blaze very brightly and the heat is overwhelming; as columns go off the relief is quick but inevitably short-lived. Wyn Evans has worked with light in different ways in other works – and there’s every chance I’ll return to his work in a later post – but I think this is the piece of his that I’ve found the most interesting and also the most beautiful. In the De La Warr Pavilion, the columns echo the light at the centre of the spiral staircase in a really interesting way but the work, on show in a small space on the first floor, was compromised somewhat for me by being reduced to three columns. 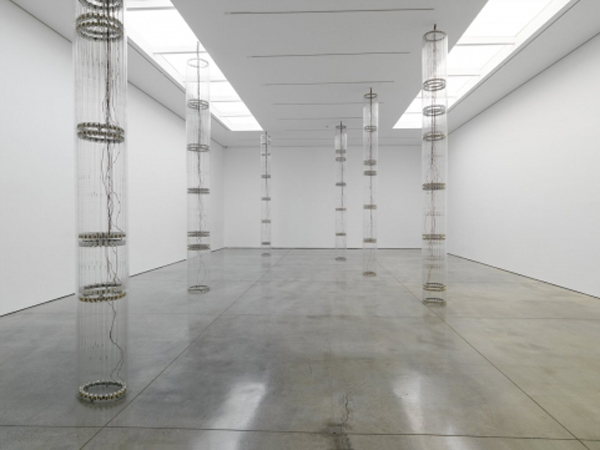 Quite simply these don’t generate enough light or heat to really replicate the intensity of the installation in White Cube. It was good to see the work again anyway – and it’s always exciting to go to the De La Warr Pavilion as it’s such an amazing building, and Wyn Evans used the space really well for the most part – but I found myself longing for the burning heat and light of my previous encounter with the work. This entry was posted in Installation, Light and tagged art, Cerith Wyn Evans, installation, light, S=U=P=E=R=S=T=R=U=C=T=U=R=E, S=U=P=E=R=S=T=R=U=C=T=U=R=E ('Trace me back to some loud shallow chill underlying motives overspill'), shallow by Ann Jones. Bookmark the permalink.